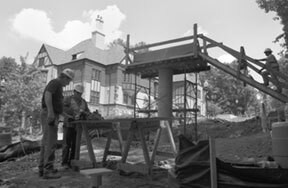 Update on major projects: Pedestrians soon will have a safe way to cross Houston Mill Road between the Miller-Ward Alumni House and the Emory Conference Center; construction on a bridge over the road broke ground early in the summer and should be completed by September. Project manager Tom Tarantino said there should be no traffic delays on Houston Mill except on Sunday, Sept. 8, when the bridge is set on its concrete supports. Click here or above for the full story. Photo by Jon Rou. Briefs: Emory police host open house; Evening at Emory registration begins. From Aug. 24 through Jan. 26, 2003, the Carlos Museum’s first-floor Works-On-Paper Gallery will host “Mel Bochner: If the Color Changes,” an exhibition of monoprints and paintings by the conceptual artist, who first began to show his work in the 1960s. Melding philosophy with painting, drawing, printmaking and sculpture, Bochner’s works in recent years have become more sensual, especially in the use of color; the piece pictured above is based on a quotation from Austrian philosopher Ludwig Wittgenstein’s Remarks on Color. Bochner will visit Emory Oct. 17 for a public discussion of his work along with art history Assistant Professor James Meyer. The event will be held at 7 p.m. in the museum’s third-floor reception hall. Photo by Jon Rou.